It has been again a long time without an update. Currently my schedule seems to be that I’ll do something every week, but the progress has not been that fast. Well of course it takes time to do things properly ;). 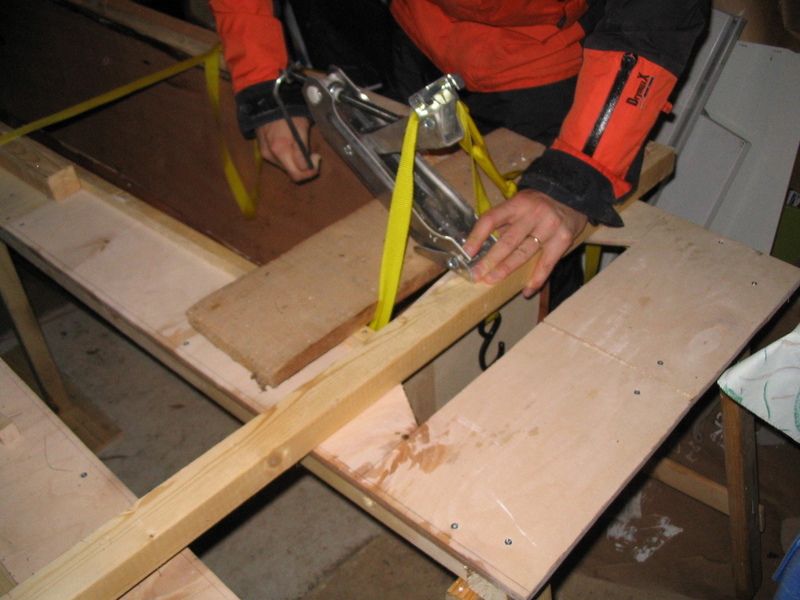 Making the bridle starts with some steel work i.e. 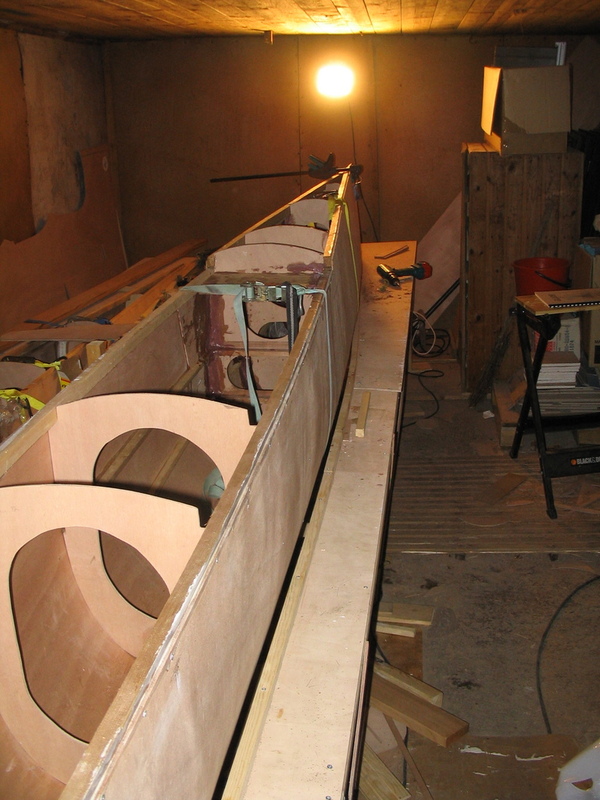 rounding the outside end and drilling some holes that let the screws go through the steel. 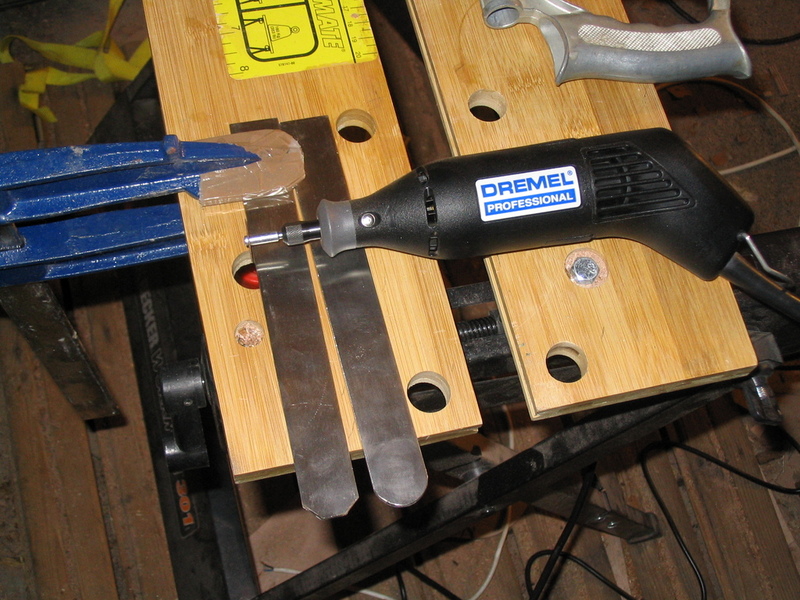 It was maybe the third time that my Dremel set was used and this time for something usefull. 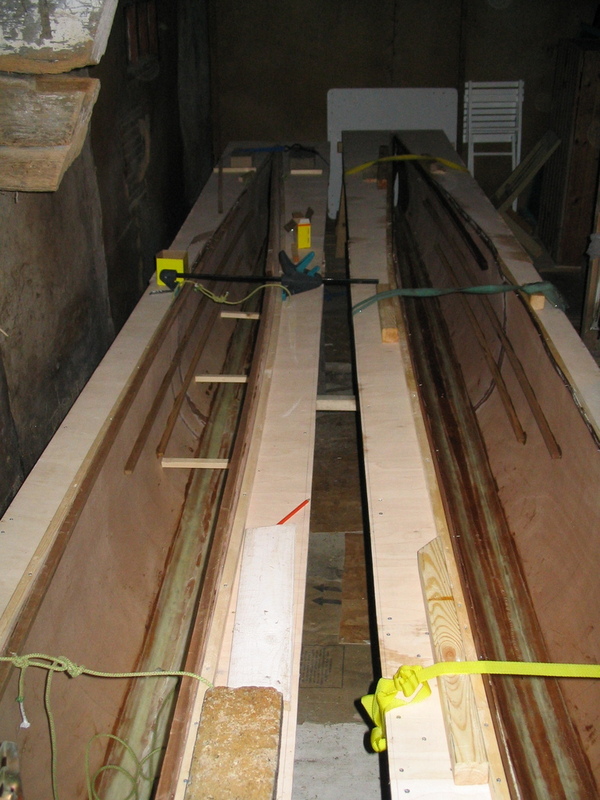 After the steelwork and making the cedar pieces for fitting it was again time to put pieces together. 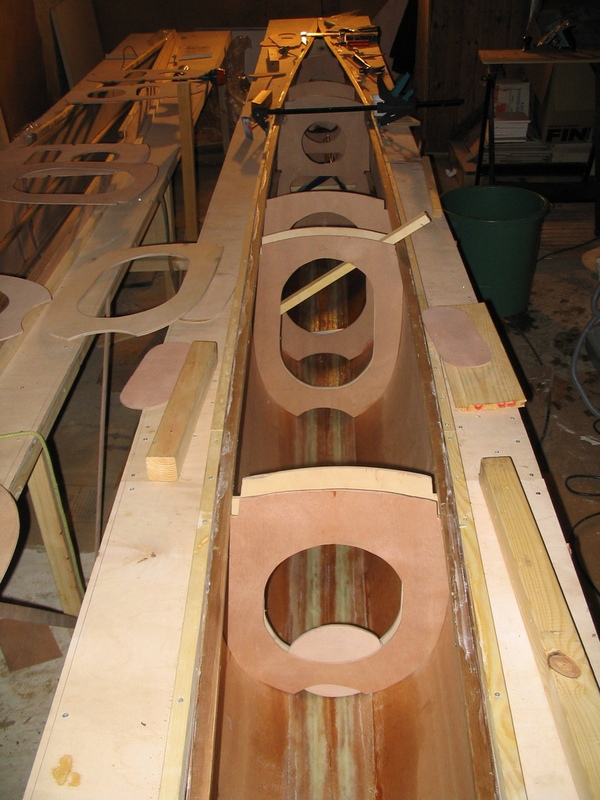 After some dry assembly, glueing the bulkhead 3, the bridle fitting and the 1/3 bulkhead (used as a back wall for fitting) starts. 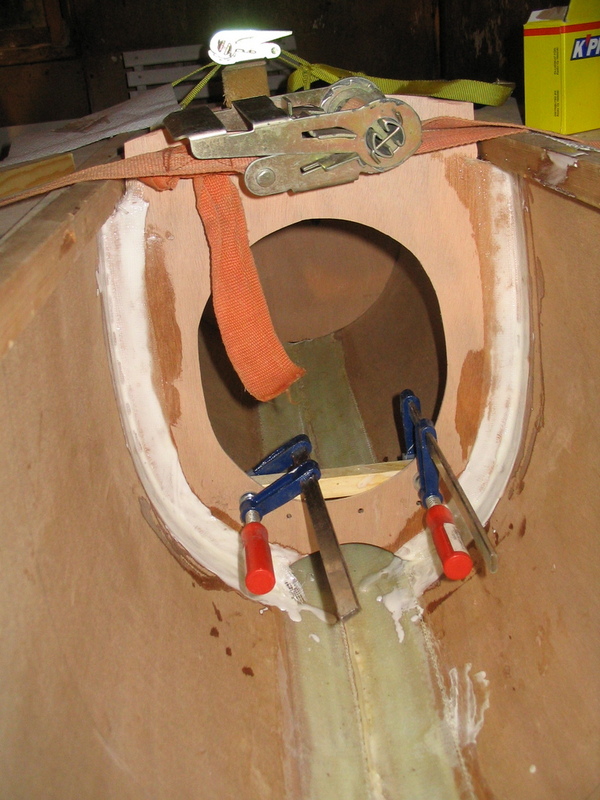 The bridle fitting will hold forestay, so I used kevlar in addition to normal glass cloth. Hopefully this will make difference when there will be lots of load on the fitting :). 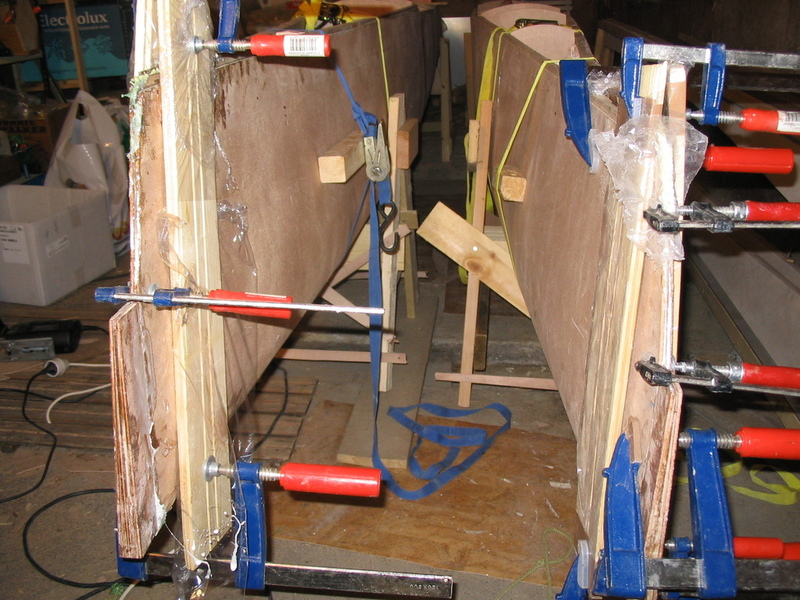 The hulls needed to be removed from deck jigs so that the bows could be glued. 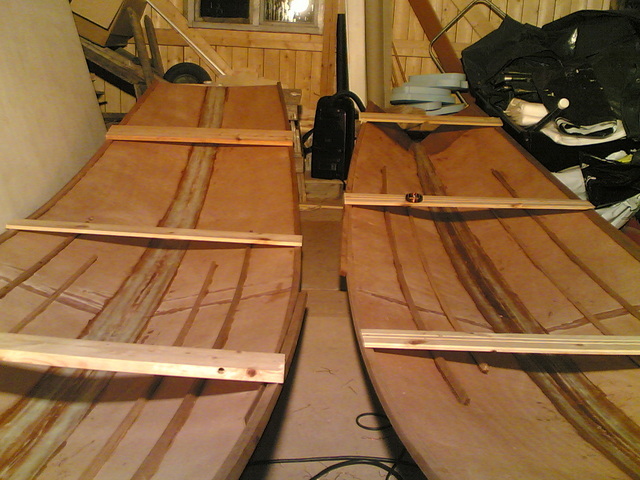 Before glueing I took apart the deck jigs so that I had more room to work with the hulls. 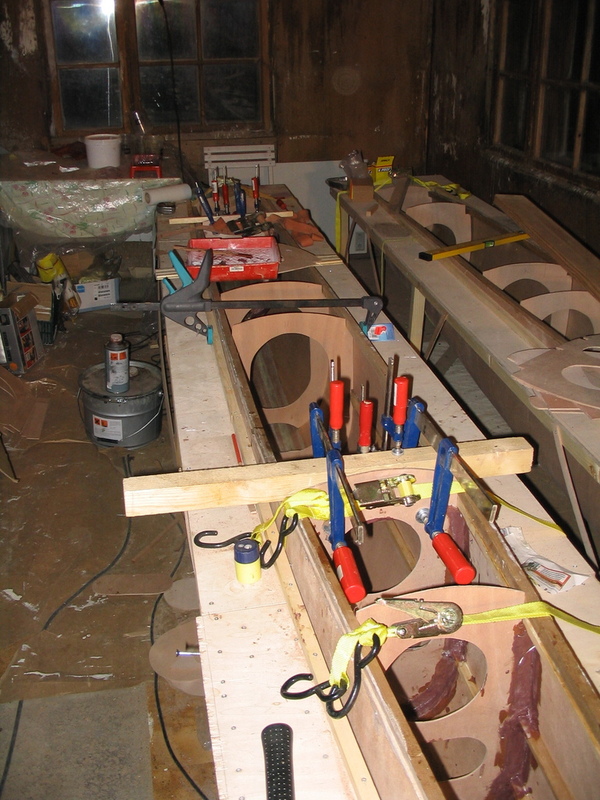 I might have been little bit paranoid when glueing because I used almost all my clamps for one bow. 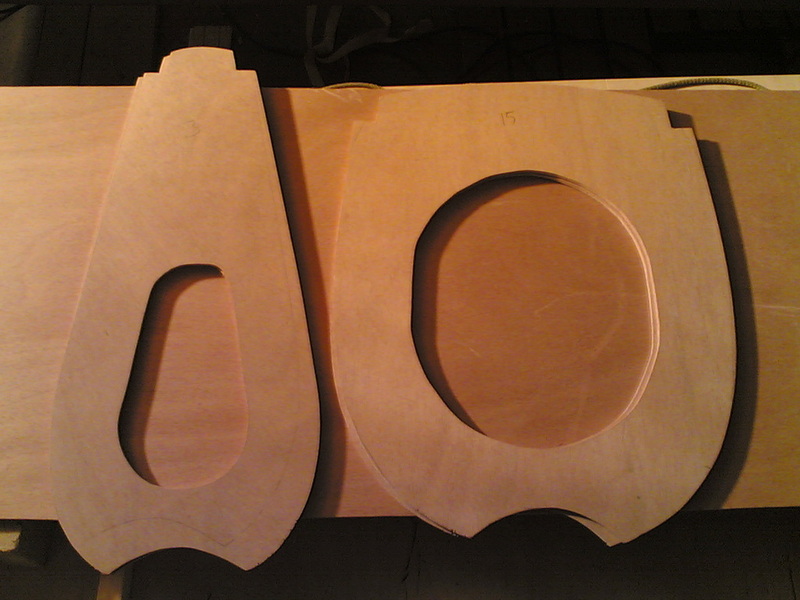 This meant that the first bow was glued last weekend and the second bow was glued today. 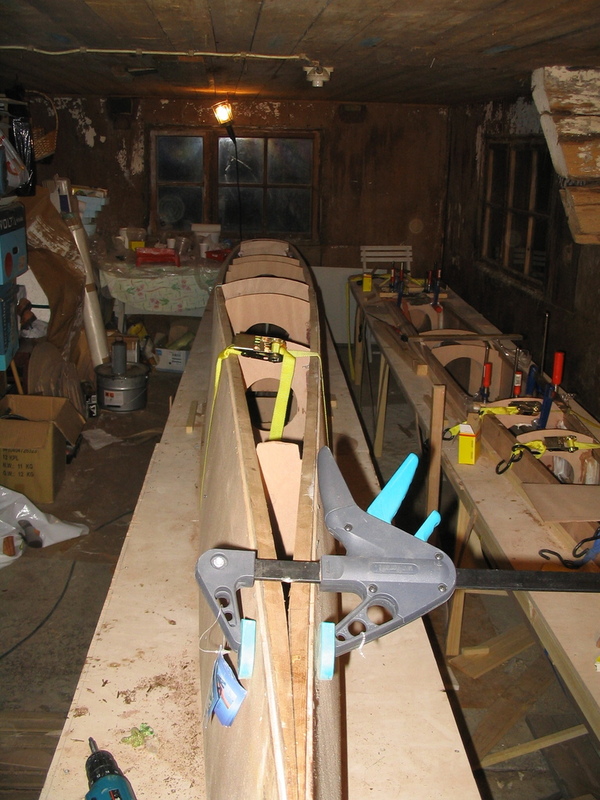 I took few pictures from the bow, the first one is from last weekend and the second from today after I glued the second bow. 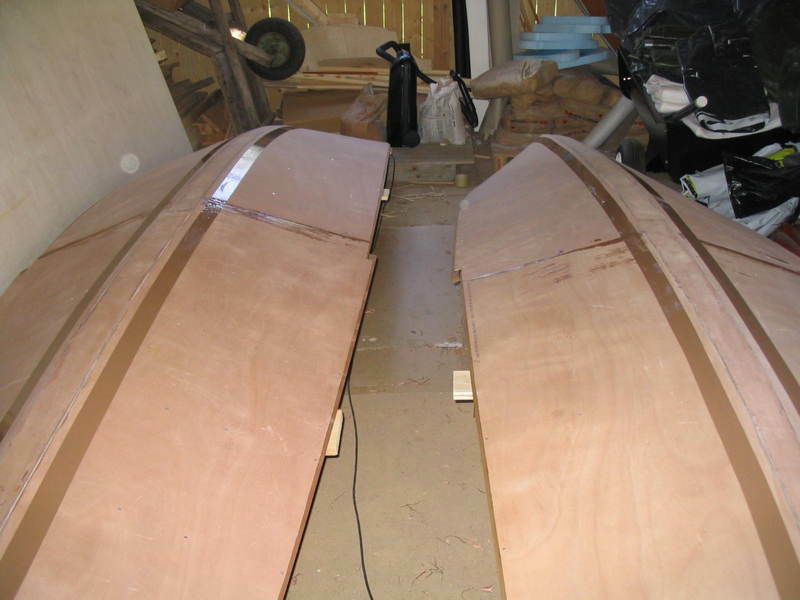 I have not yet made the daggerboard case because I ordered high aspect ratio daggerboards from Catamaranparts and in the plans the case is designed for low aspect ratio boards. 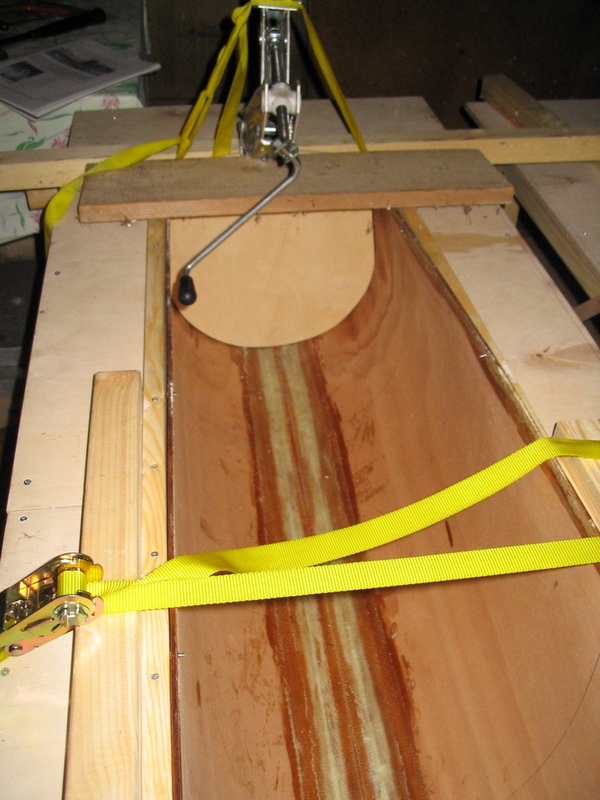 My daggerboards came this week and I took a picture that shows the depth. 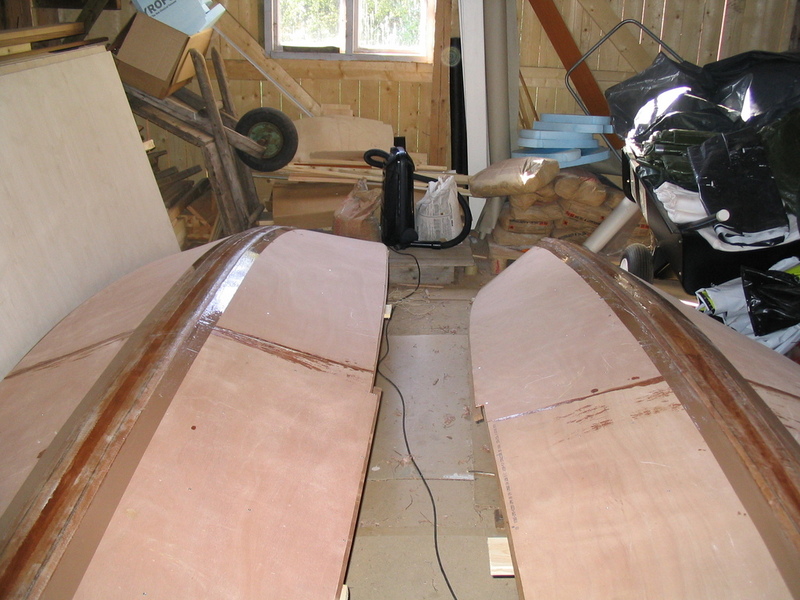 The daggerboards are longer and thinner than in the original plan. 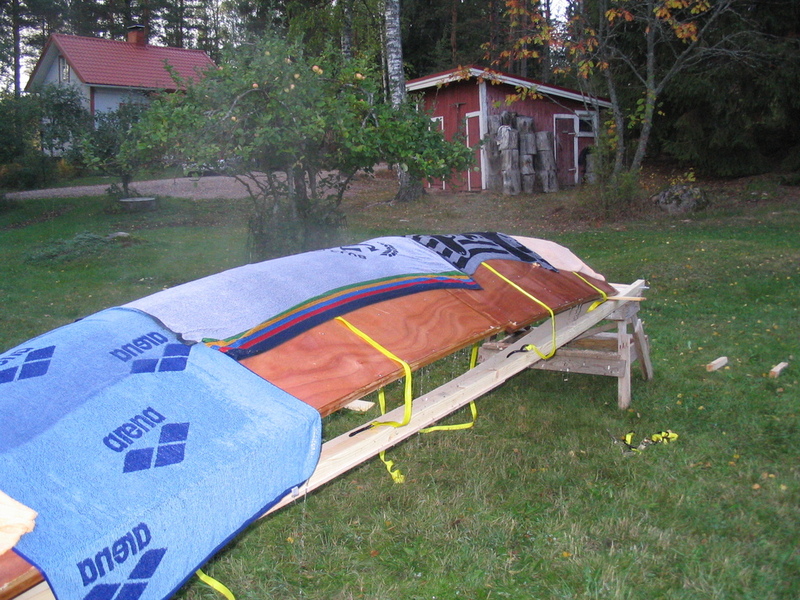 It seems that I need to be very carefull with the Finnish rocks, otherwise I’ll be rebuilding and fixing in no time ;). I have a bit of history of finding them with my (boardless) catamarans and even with the masts :). Well I took couple of pictures though. 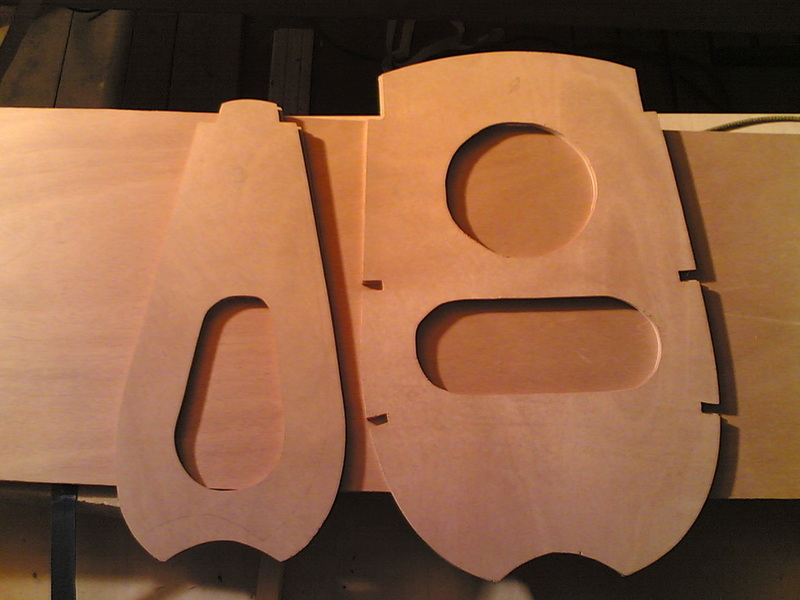 The first one above shows the frontmost and biggest bulkhead together. 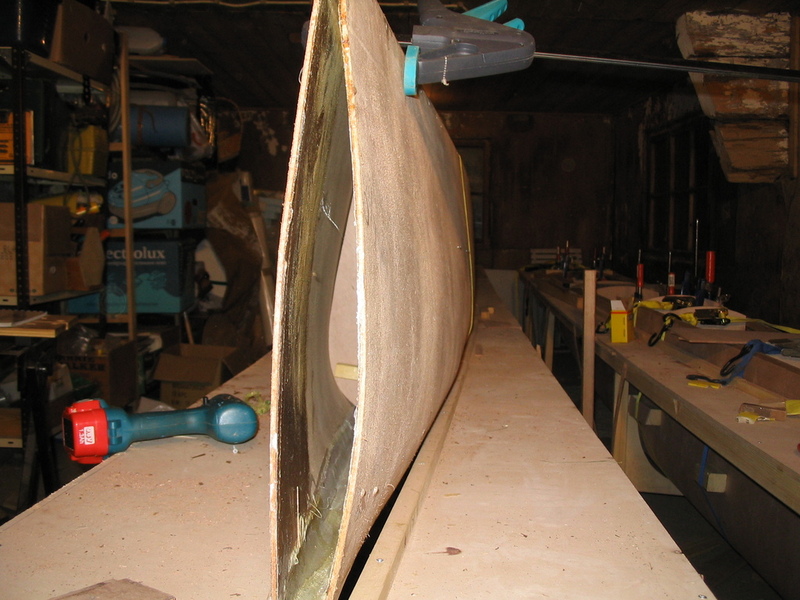 The smaller bulkhead show the hull shape at bow, it shows that the Blade design has quite much of flotation volume near keel line. 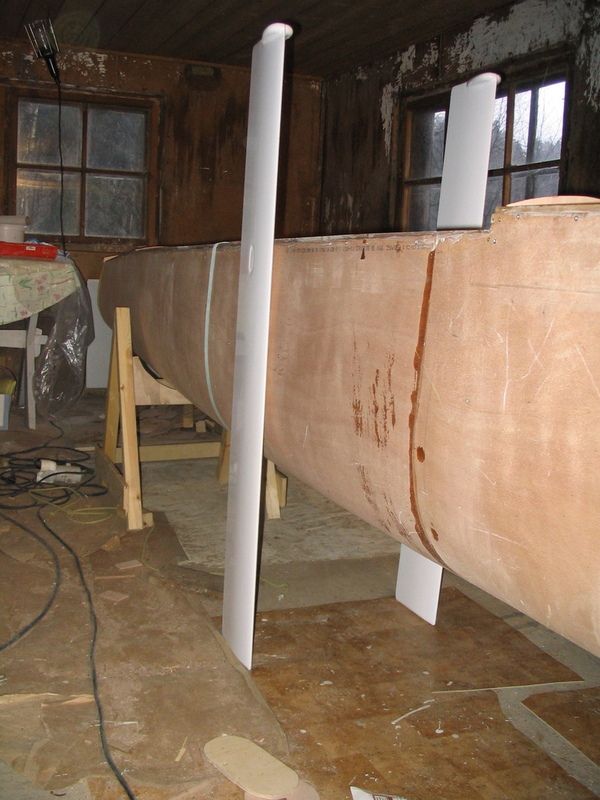 The bigger is just front of the front beam, the hull changes quite much in one and half meters. I took also picture with the last bulkhead. 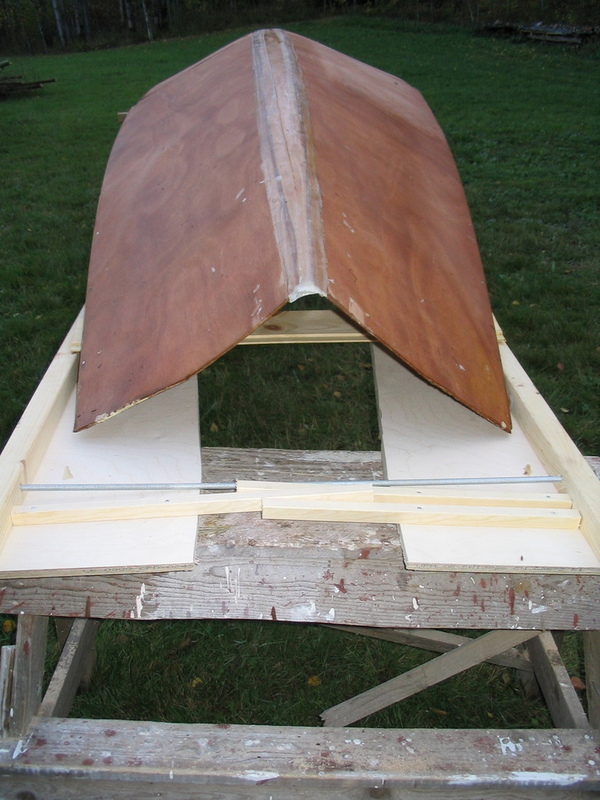 The picture above shows nicely how hull shape changes from bow to transom. 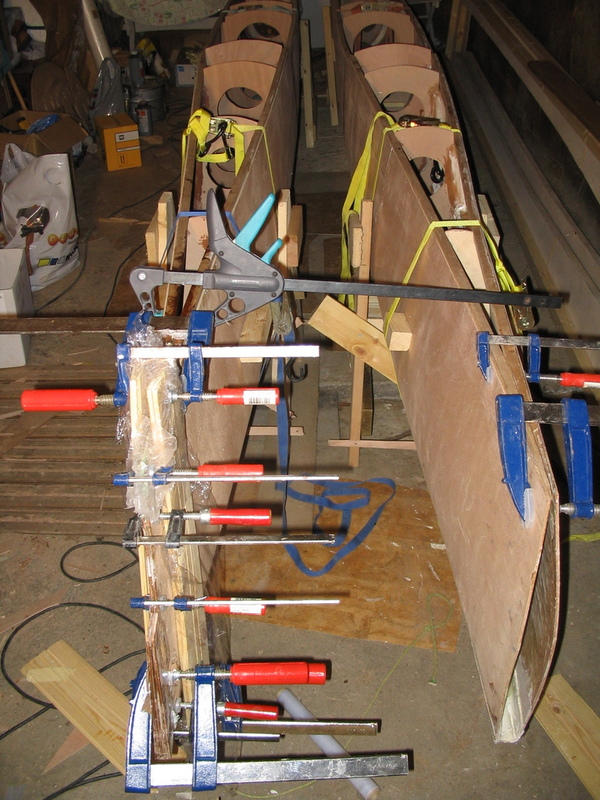 The bow stems contains two layers of glass and six layers of plywood, so making the stems starts with cutting the plywood and the glass. 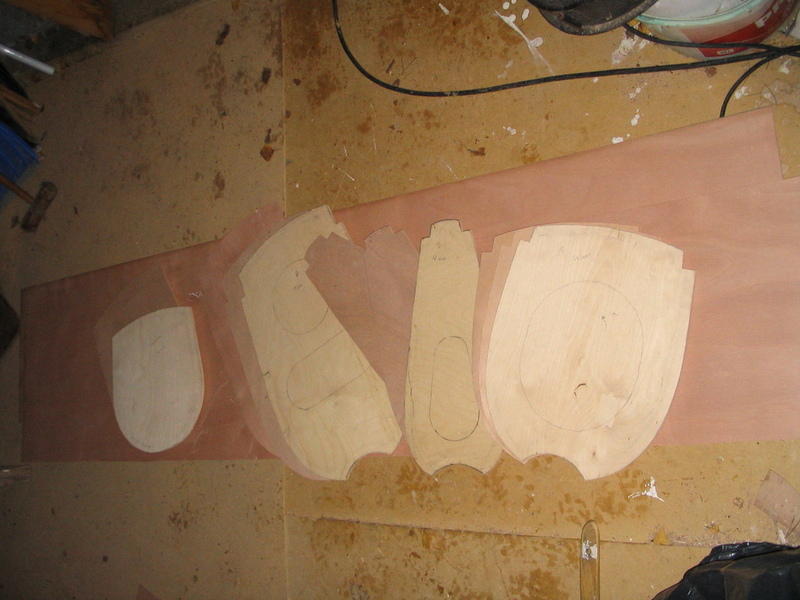 After the pieces are finished the resulting jiggsaw puzzle needs to be solved with glue. 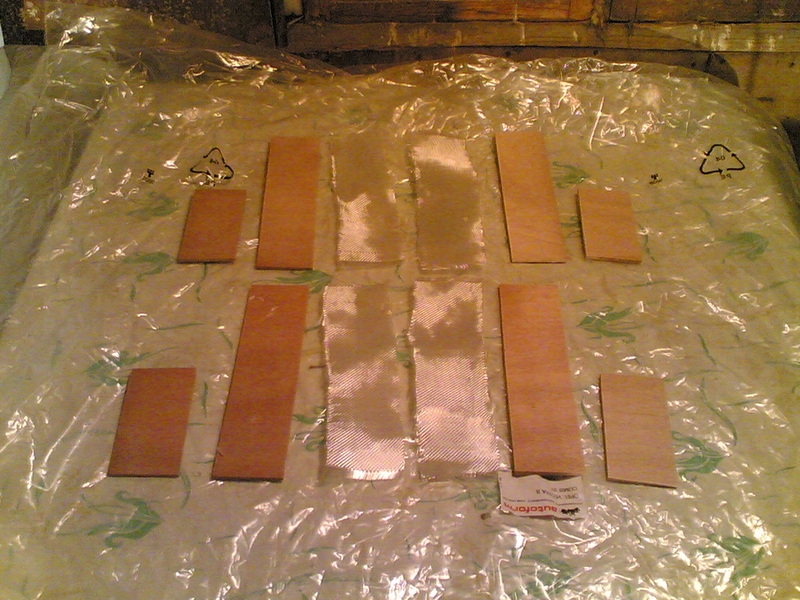 The picture below contains the puzzle pieces. 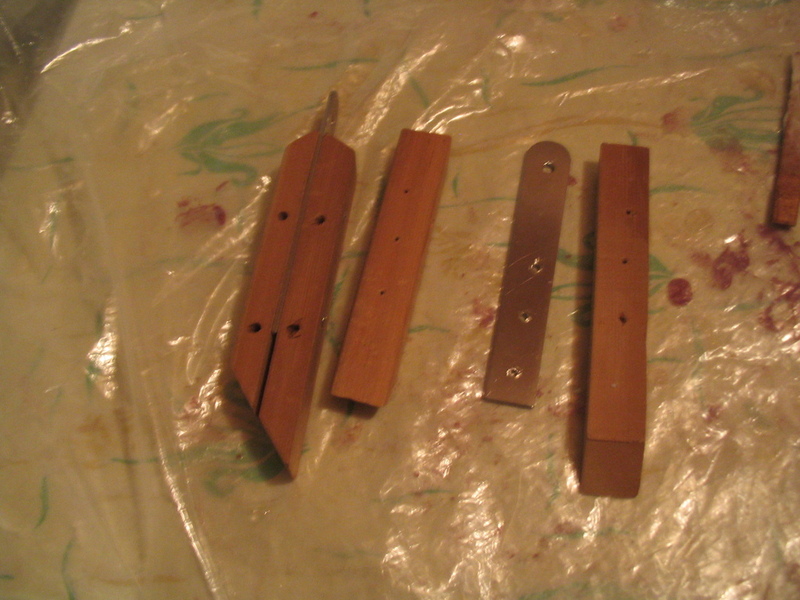 After the pieces are glued and the glue has cured the stems need to be planed. 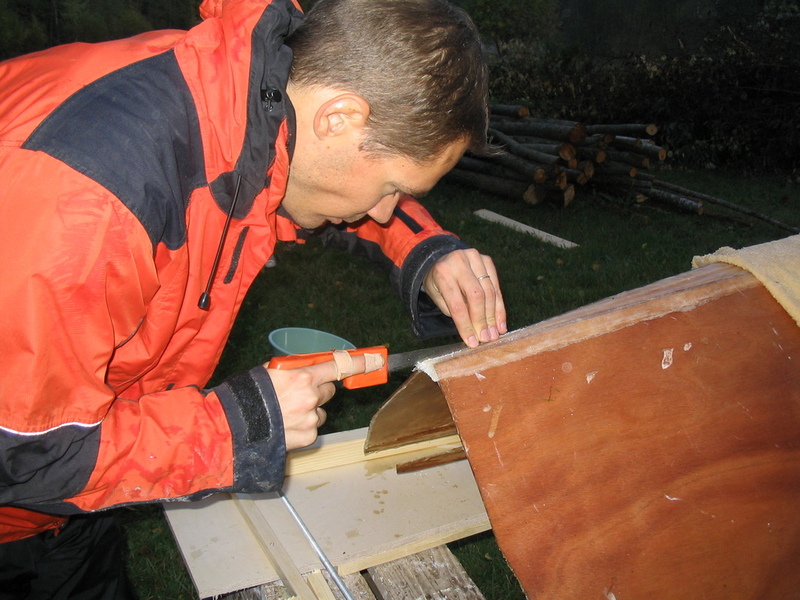 Planing is much faster with the Blade builders best friend (i.e. electric plane), it took around five minutes for each side. 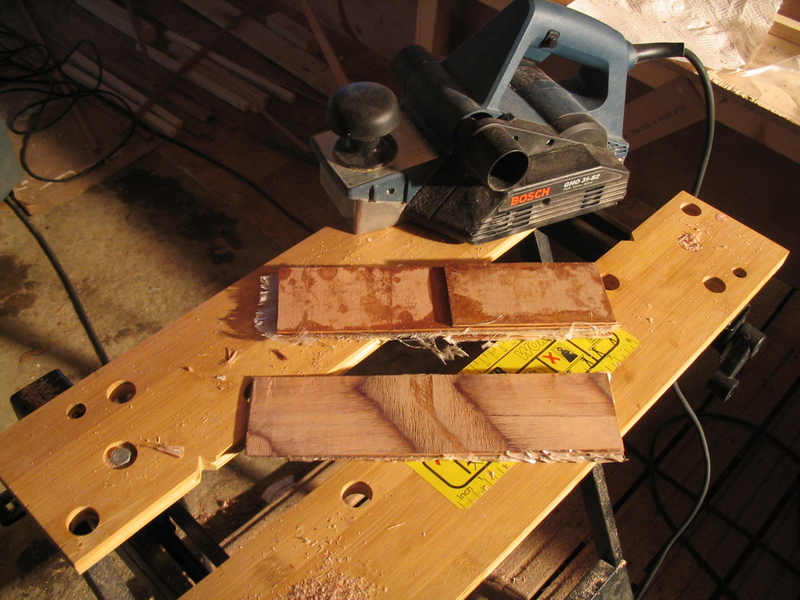 In picture below one of the stems is already planed. 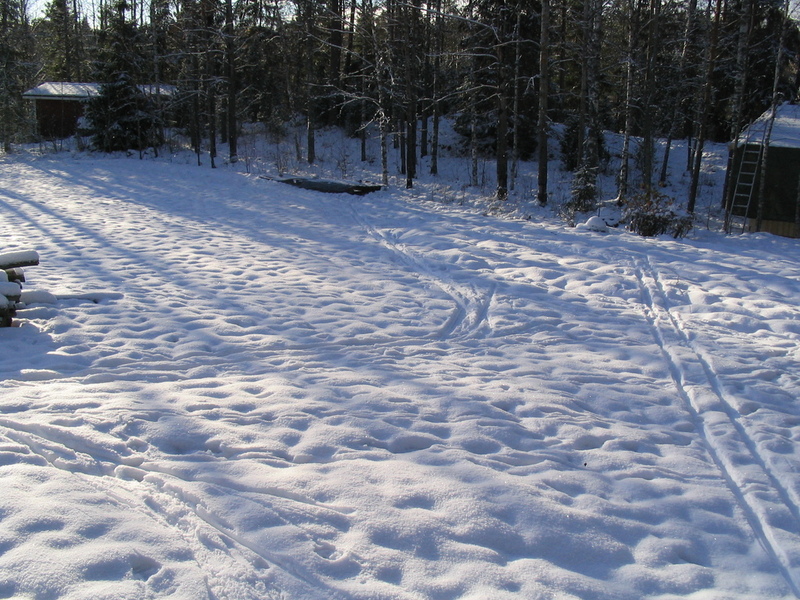 We have snow here in Finland, but luckily the Blade is now inside. 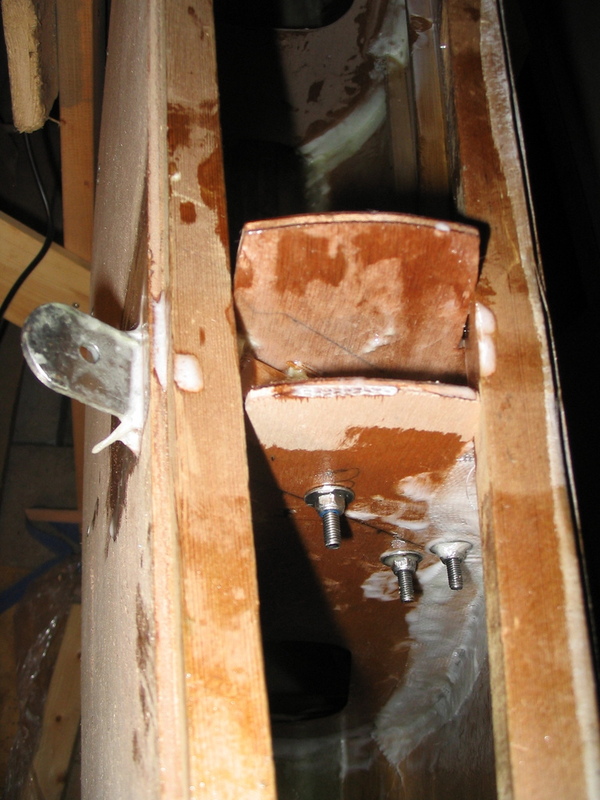 Following picture shows place where I was torturing the hulls month ago. 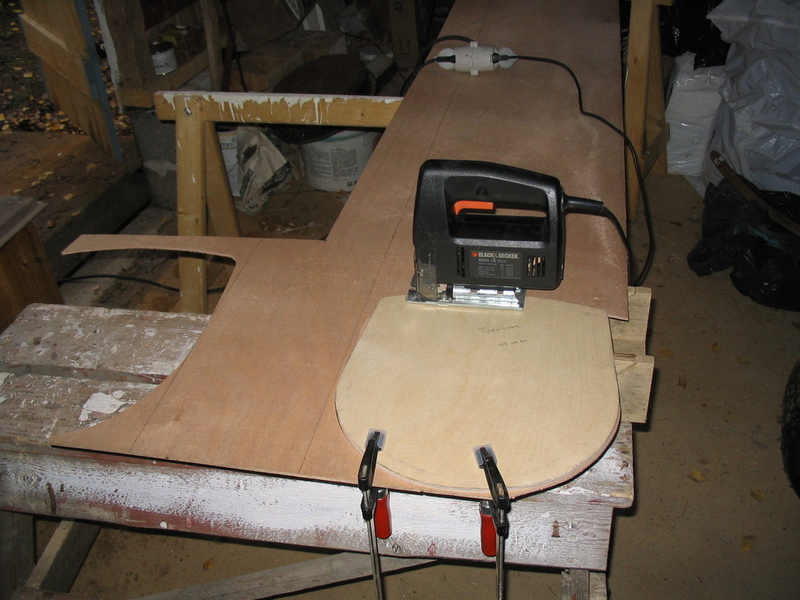 There is already some ski tracks instead of plywood being steamed ;). I have been lazy couple of last weeks and have not updated the blog. 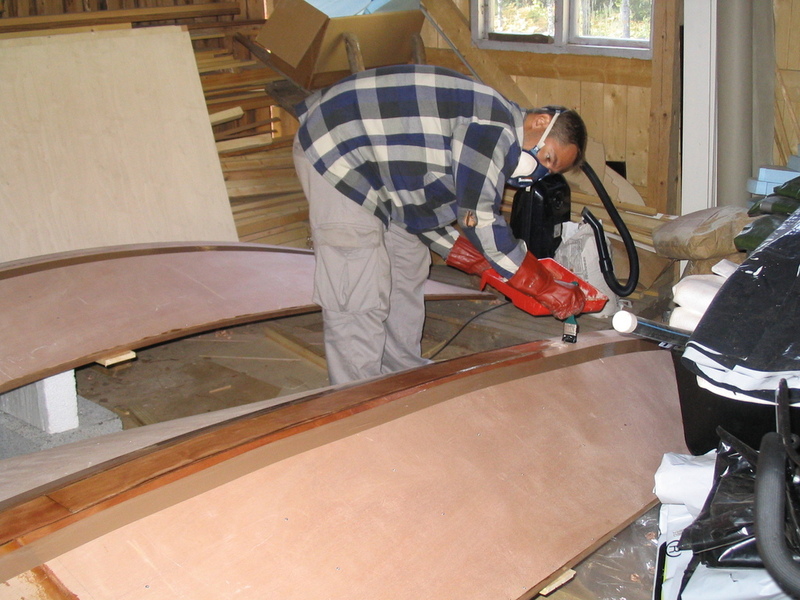 The remaining bulkheads were cut at the end of October and yesterday I reglued the missing gunwales. 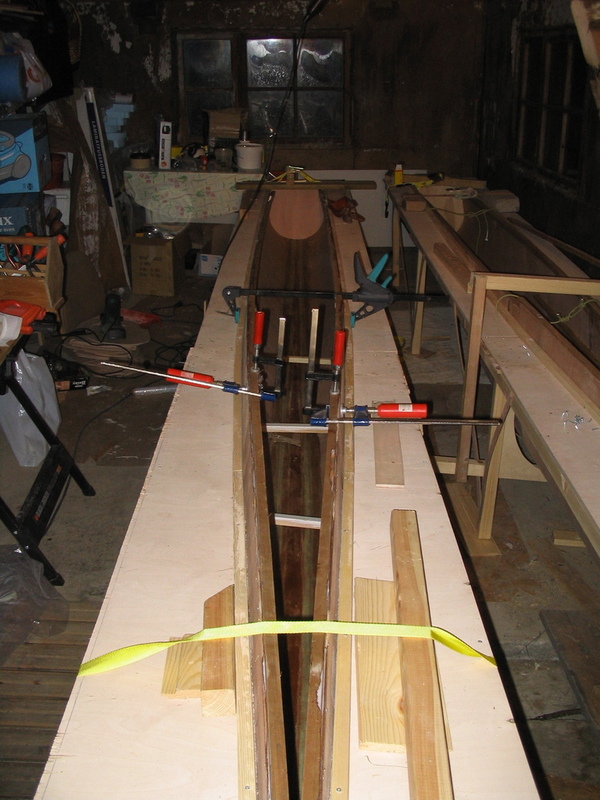 Following picture show the newly attached gunwales. 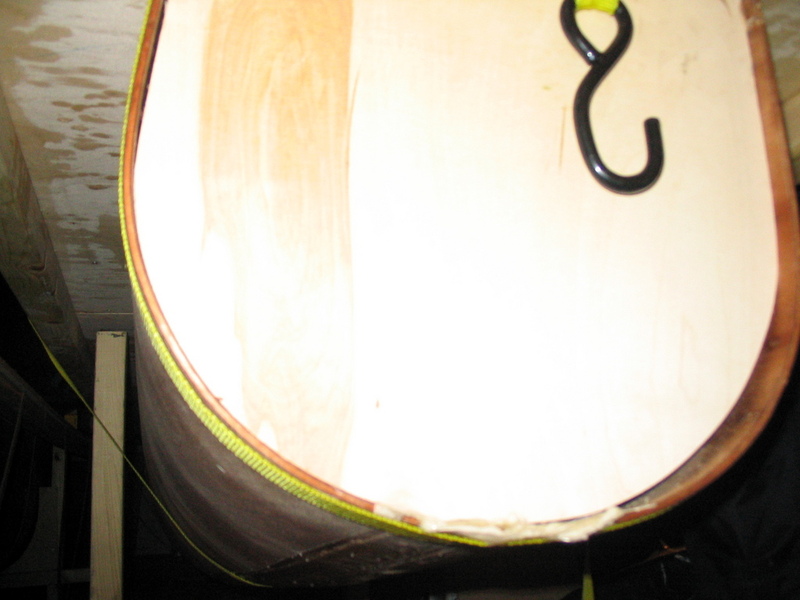 After letting the inside keel dry for a couple of days the hulls were turned around. 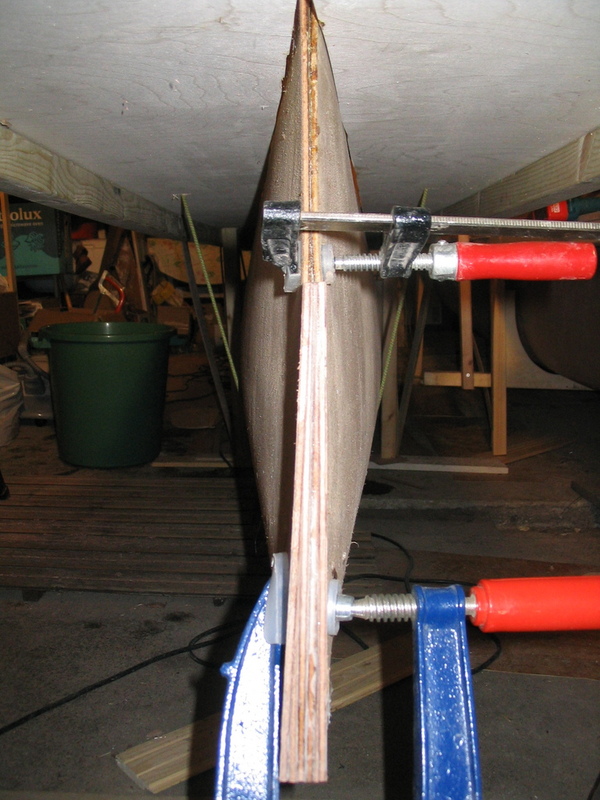 The outside keel joint is sharp so it has to be trimmed with a plane and sanding paper. 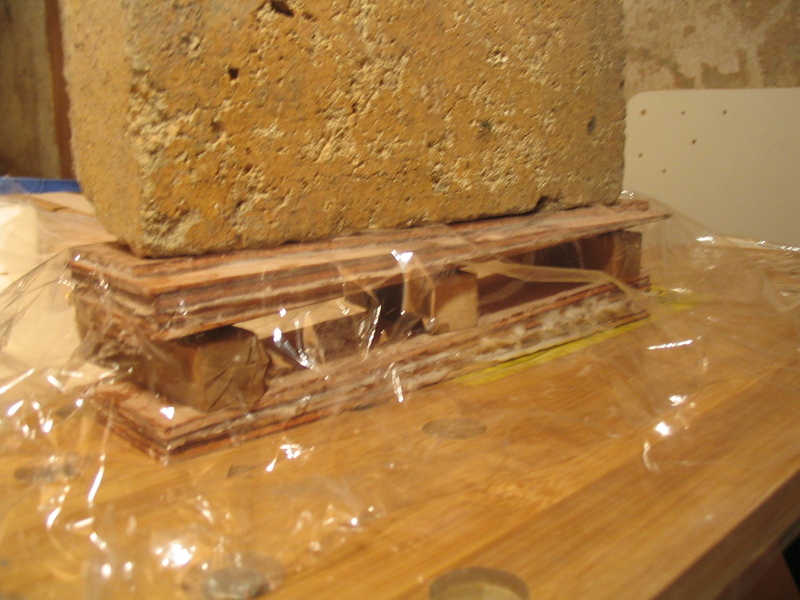 Also some packing tape needs to be applied to prevent the epox from spreading on the hull sides while glassing. 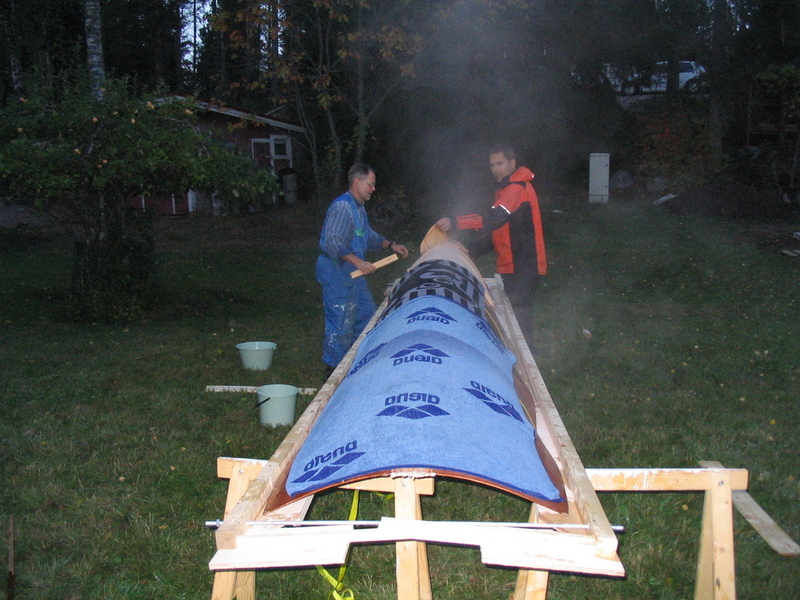 The picture below shows the prepared hulls. 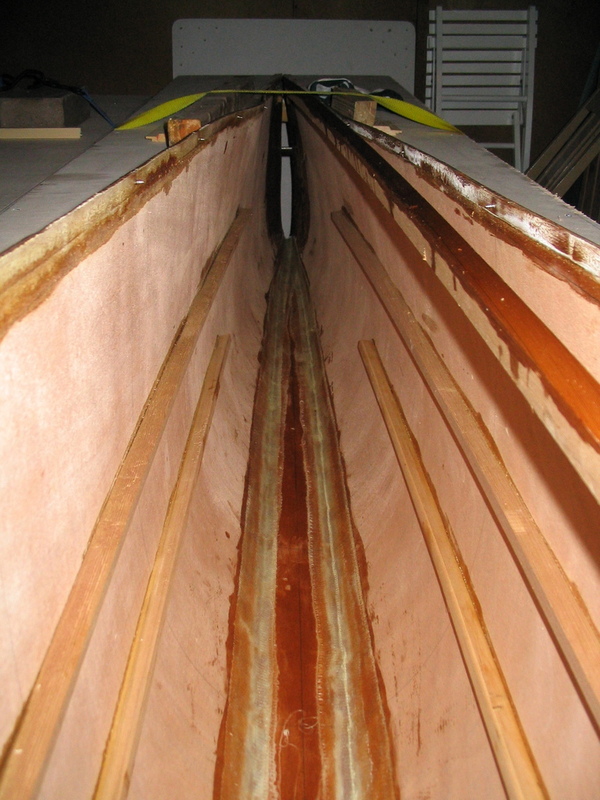 Prepared keel area needs to be primed with epox. 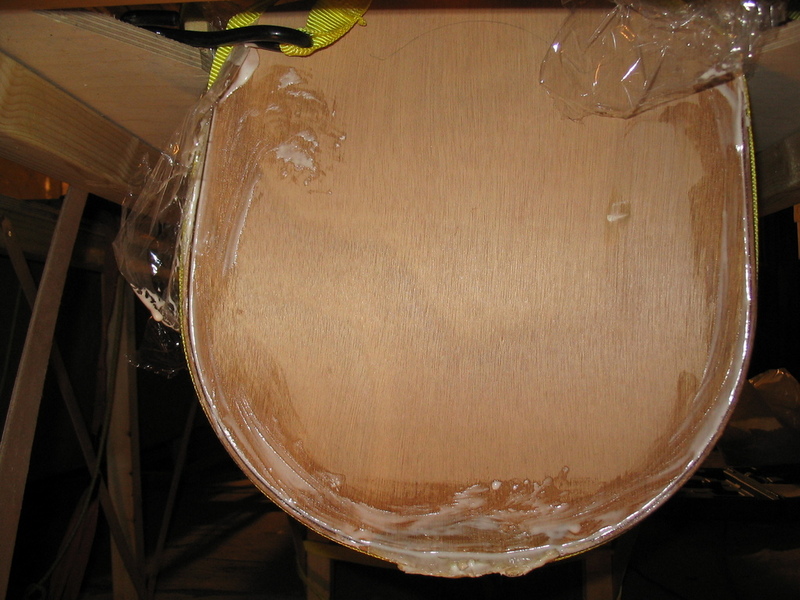 The 5 cm glass tape is then wetted and placed on top of the keel joint. This was nicely done in a one short session of 4 hours. 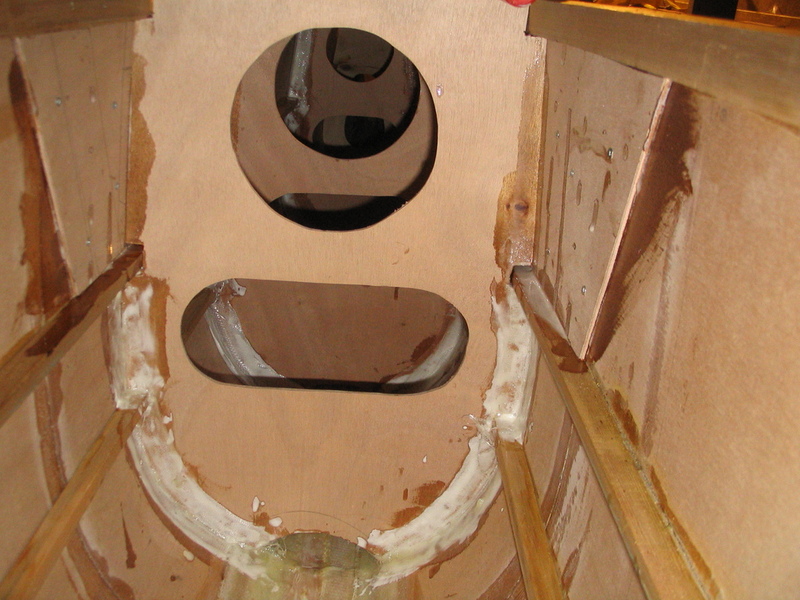 With the second try I managed to glass the inside of the keel without any hazards 😉 Practising and careful preparing seems to work. 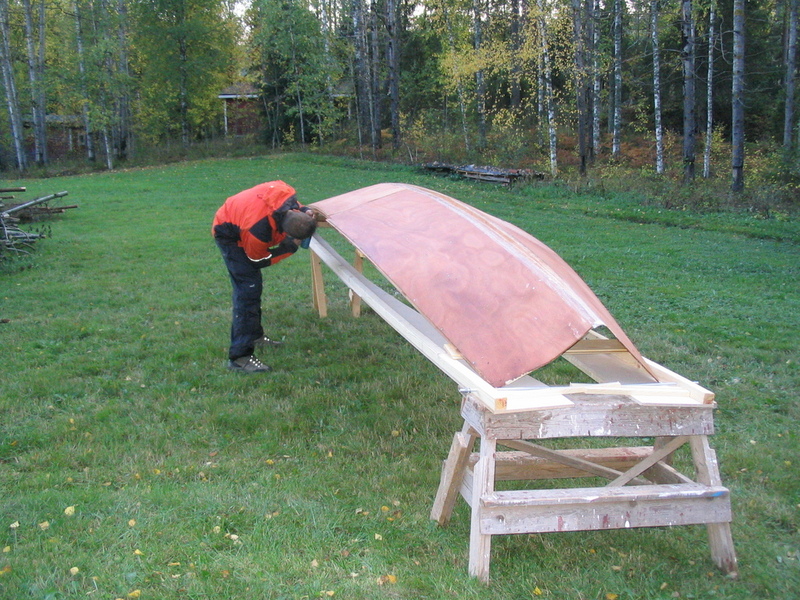 This took two days, one day for each hull.